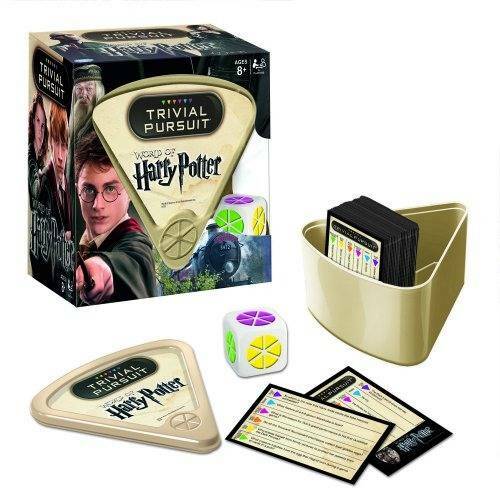 Play Harry Potter Trivial Pursuit from the car, on family road trips, or anywhere! Pause your game of Quidditch! Harry Potter fans test their knowledge of the beloved Harry Potter movies with TRIVIAL PURSUIT: World of Harry Potter. This quick-play Trivial Pursuit game can be played on-the-go with its portable wedge holder. The 600 questions range in difficulty levels, so even the expert wizards will be challenged! Six trivia categories include: The Dark Arts, HOGWARTS, Magical Spells & Potions, Magical Objects, Magical People and Animals & Magical Creatures.